Many of us can relate to the feeling… You look in the mirror in the morning and you notice the dreaded dark circles under your eyes. Dark circles will make you look tired, older and in severe cases, they make you appear unhealthy. They can happen at any age, but the older you are, the more chance you will see it happening. There are some basic reasons why this discoloration appears. It can be a single cause or a combination of causes that result in this darker skin under the eyes. An article from Mayo Clinic suggests that fatigue is the leading cause of dark circles. Not getting enough sleep can cause bags to form under the eye or puffy eyelids. These shadows can make it look like you have dark circles. The best way to combat this, is to get enough sleep. The National Sleep Foundation recommends that adults between the ages of 26-64 should get 7-9 hours of sleep at night. Doing so on a regular basis, should help any puffiness and dark circles decrease. If you are not drinking enough water, your body will become dehydrated. When this happens, there is not enough fluid in your body to provide your skin with the water it needs to stay plump and healthy. When there is insufficient fluid in your skin, it will look thinner and will sink in around the hollows of the eyes. This will create dark circles under the eyes to form. Heredity definitely plays a role in the appearance of dark circles. It is also referred to as genetic hyper-pigmentation. This article states that it is the most treatable types of under eye circles by the use of lightening creams, laser therapy and chemical peels. It is a well known fact that the sun is damaging to the skin, but often we forget about the tender skin around our eyes. Many of us apply sunscreen to the body and maybe the nose and cheeks, but the under eye area tends to be missed, causing dark circles. 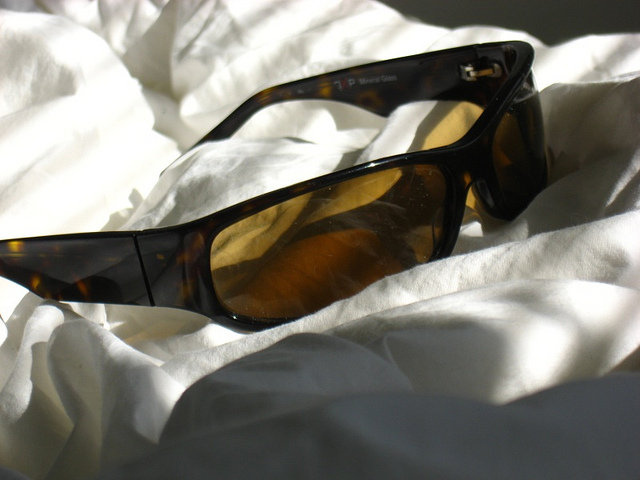 One of the easiest ways to protect the eye from the damaging rays of the sun is to wear sunglasses. It is also important to apply eye creams that contain an SPF to prevent further damage. As we get older, we lose some of the fatty tissue in our face, causing it to look hollowed out around the eyes. Your skin may look sunken in around the eye area and it will appear darker. Apply day and night eye serums on a regular basis. This will help slow down the decrease in elastin and collagen loss that occurs when we get older. The skin will thin more slowly and will stay plumper longer, than if eye serums were never applied. Of course, if genetics play a part in the development of dark circles around the eyes, then it may be difficult to eliminate them completely. The best thing you can do is to stay well rested and drink a sufficient amount of water to avoid dehydration. There are skin care products on the market that can assist in lightening the skin underneath the eye area. Apply them gently and as directed. Be sure not to pull or tug on the thin skin around the eye. Doing so will cause wrinkling, which is another issue altogether. Cosmetics will also help to cover up the dark circles. Invest in a quality concealer and foundation. When applied correctly, you will make your dark circles virtually invisible. For further reading, check out: Anti-Wrinkle Fruits – 4 Best Fruits To Reduce Wrinkles and How Does Drinking Hot Water Help With Anti-Aging.